Design Team member Jen Randall is returning for a second year, and she's kicking it off right with these Fall Wood Word Blocks. "I LOVE decorating for fall. After a season of bright colors, I love to warm up my home with the colors of autumn. 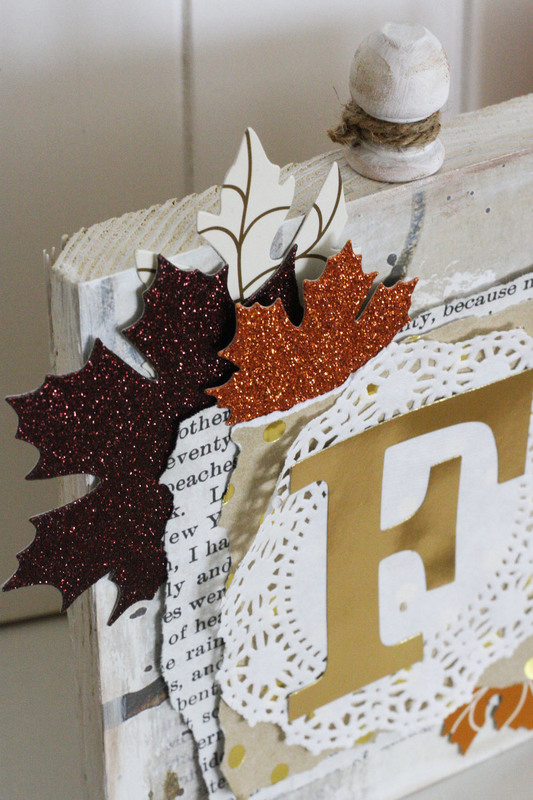 When I saw the mambi Fall Leaves Die Cuts, I was immediately inspired to use the beautiful glittered leaves. They are SO pretty and the colors are perfect. I have seen wood letter blocks in home decor stores, in friends' homes, and on Pinterest. I thought making my own with scrap wood from my garage would be super fun. Plus, after seeing these large Gold Alphabet mambiSTICKS letters -- it was a done deal." 1) Sand and paint four wood blocks white. Paint small wood finials for the tops too. 2) Cover the block with paper. Jen used a beautiful sheet from Mixed Media pad that matched her color palette. To cover, place the Mod Rodge on the block and the back of the paper. Smooth down using an old credit card to get rid of air bubbles and help the paper adhere to the wood. Allow to dry. 3) After you have covered all 4 blocks, use the white paint and blend around the edges to make the paper look like it is a part of the wood, not just stuck to it. 4) Make a cup of coffee or tea, relax, and enjoy it! Be sure to save a bit. Use that coffee to drip on the blocks for added texture. Let dry. 5) Using the large gold letters as a guide, rip several different papers of choice. 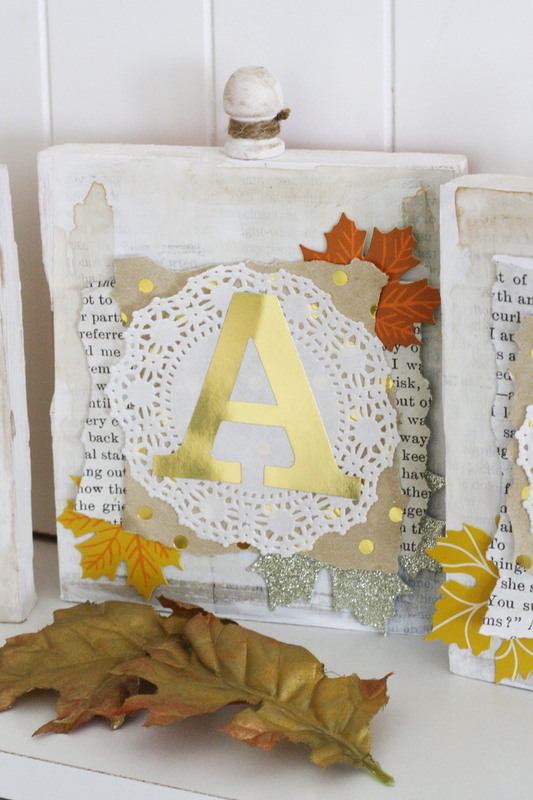 Stack together, add a doily on top, and place your letter. 6) Attach your stack to the center of each block. Use the mambi Fall Leaves Die Cuts to create clusters around each stack. 7) Glue small wood pieces to the top of each block and wrap twine. 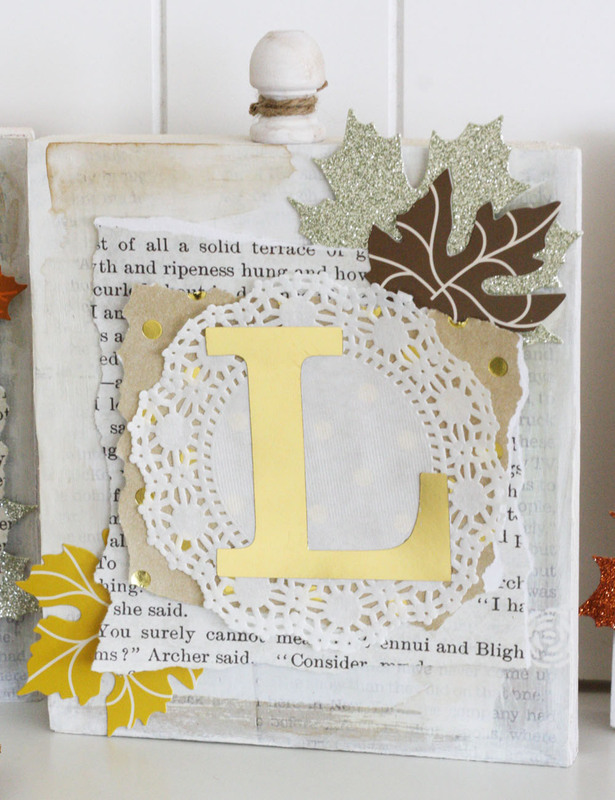 8) Finally, add small touches of gold paint, let them dry, then find a great place to display them! Hi, everyone! My name is Jen and I live in southern California with my husband and two adorable children. I absolutely loved being a part of the mambi Design Team last year, so I am super excited to be back for another! I am a former elementary teacher turned mixed media artist who loves all things creative. I love painting, art journaling, DIY, memory keeping in all forms, crafty home projects...well, just pretty much everything! I have always had a bit of the creative bug and about 4 years ago, I discovered mixed media and never looked back. Also, wanting to find a way to tackle my family photos, I stumbled upon pocket scrapping in 2012. It was such a fun way to document life! I fell in love with the process and added it to my artistic list of projects. I am looking forward to a year with tons of mambi goodness, fabulous projects, and whole lot of inspiration.